All truffles are made in an environment where nuts and milk products are used. Ingredients in italics are potential allergens. 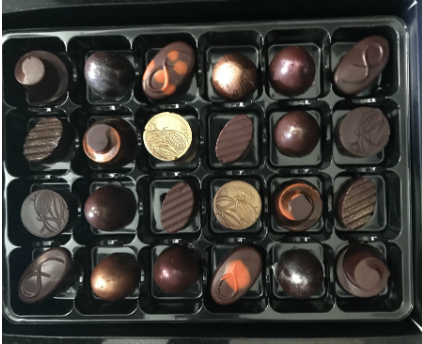 12 handmade vegan truffles made entirely with non dairy ingredients: Flavours include Salted Caramel, Mango and Passion Fruit, Coffee, Raspberry, Peanut Butter, Guatemala, Haiti, Rum, Gin and Tonic, Prosecco, Mojito and Orange Liqueur. Ingredients: Dark chocolate, (70% cocoa solids), water, sugar, coconut cream, prosecco, raspberries mango, passion fruit, tonic water, orange, salt, vanilla extract, coffee, peanut butter, rum, gin, lime, mint, cointreau. 24 handmade vegan truffles made entirely with non dairy ingredients. 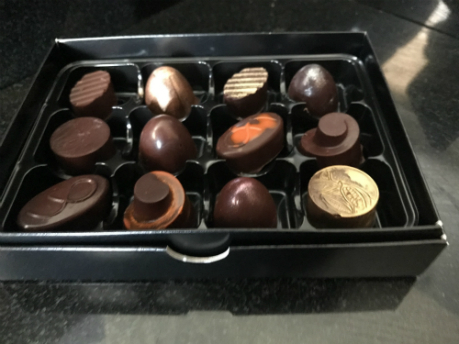 It consists of two each of the following truffles: Flavours include Salted Caramel, Mango and Passion Fruit, Coffee, Raspberry, Peanut Butter, Guatemala, Haiti, Rum, Gin and Tonic, Prosecco, Mojito and Orange Liqueur.